An essential ingredient of traditional tabouli is bulgur (cracked wheat). I don’t know about you but that’s not something I have frequently in my cupboard. 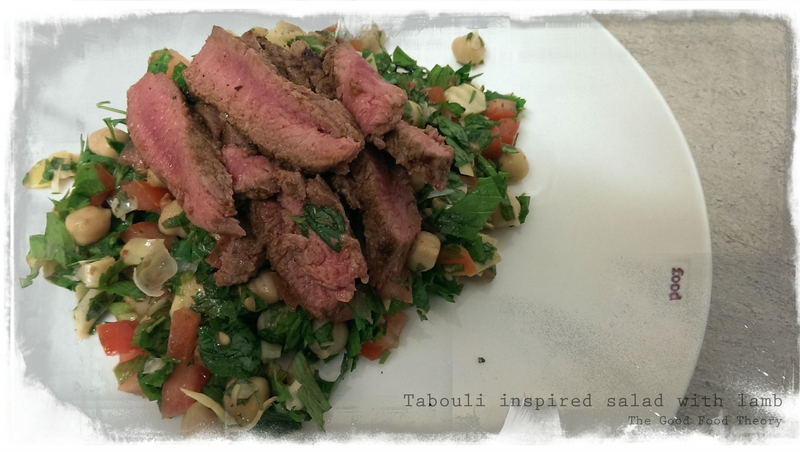 That doesn’t mean you can’t make some tabouli inspired though. When you’re missing an ingredient, see it as an opportunity to use what you have, to create something new. Instead of the traditional bulgur, I used what I could find: tin chickpeas and marinated artichokes. To finish, I served it with some lovely lamb and a dollop of Greek yoghurt. Yum! I’m delighted you like it and thank you for your kind words. I haven’t had a chance to make your delicious avocado banana bread yet 🙂 Definitely will though and hopefully soon! I’m glad to hear you still have the avocado banana bread in mind! 😀 With the holidays coming up, it’s definitely been hard getting around to making everything on our lists!